After having seen the film I figured it might be fun to find out how Lehane had achieved his story's central misdirections and atmospheric build-ups using verbal rather than visual cues. 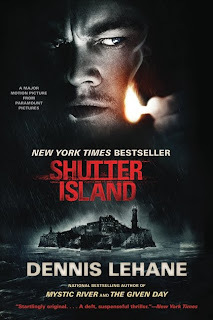 Also, the ending to Shutter Island is the sort that makes revisiting the story in another format not entirely unattractive, since it can "read" in a different way with this knowledge, and specific exchanges can literally be re-interpreted. In addition, I was curious about Lehane's writing style, after having seen some very positive reviews of his books accrue over the years. (It also didn't hurt that every film I've seen based on his material has been well-crafted). This one's a quick read. The pace, for the most part, is frantic (at least psychologically). Attention to details, setting etc. are satisfying but not memorable. The characterization, particularly tricky in the service of this plot, is handled deftly, though I began to find some of the flashbacks and depictions of trauma a little over-the-top and "trashy" towards the latter sections. The writing itself is smooth, and very confident, but Lehane's tendency to write run-on sentences and to increase the drama through Dramatic Description and Breathless. Punctuation. became a little distracting and wearying after a while. In short, delivered the goods I was expecting, and mostly riveting as nail-biting entertainment, but in the final analysis somewhat contrived and not particularly profound.